I don’t actually agree with that view. A 4MOA AK clone is plenty useful for its intended purpose. But given that we the people are far behind the most probable enemy in firepower, we have two main options. The first is to close in and so avoid the enemy support weapons. That option is a loser because we are overmatched on the rate of fire, the amount of body armor, on the availability of grenades and closer quarters training in general. The second option is to sniper from stand-off distance. While that makes us vulnerable to indirect support weapons as well as to vehicle mounted stabilized machine guns and cannon, it gives some chance of escape without detection. Absent sufficient explosives to make an ambush count, that means relying on the first shot hit against distant, armored and possibly moving foe. The cost in inaccuracy isn’t in the ammunition but in the risk of detection and in the the exposure to return fire. In that sense, only accurate rifles with good ammunition and very, very competent shooters are interesting. My fondness for the mfour-22 shown is that it is MOA accurate. That allows realistic training with much of the ultimate effectiveness being in the skill of the shooter. Now, it is possible to conduct ambushes with inaccurate weapons. For example, a sniper would open up with a single round and much closer shooters on the opposite side would fire once the noise of the return fire masks the reports of their lower power short range arms. But body armor is likely to make tactic that less effective than it would have been during WW2. But that’s all silly talk. Nothing bad is coming up in the near future and the main purpose of this mfour-22 is fun. 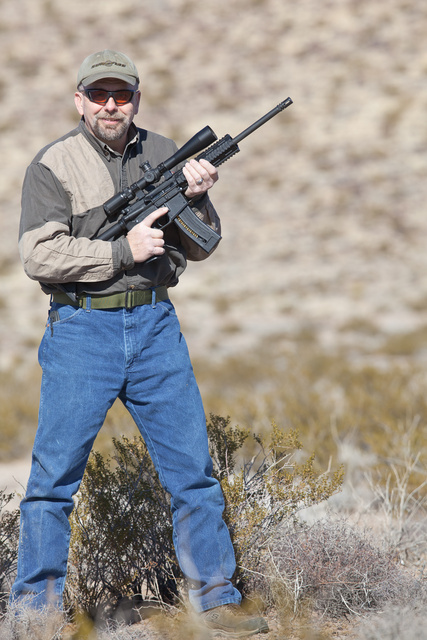 A day out on the range is good for the mood and for the physical health also — especially if you jog to the 100 and 200 yards backstops when changing targets. You don’t get as much cardiac exercise while playing shooter video games. This entry was posted in rifle, rkba, self-defense, training, weapon and tagged 22LR, ambush, civil, fun, guerrila, sniper, war. Bookmark the permalink. You know what I think about that subject. Even in the context of that argument, however, it is worth noting that very, very few civilian-owned weapons will allow you to defeat standard issue military body armor from such a distance that the difference between 3 MOA and .5 MOA matters. That’s why headshots or trying to reach around the plates are an option — and that’s why great accuracy is important. Mind that “accuracy” doesn’t mean 0.3MOA rifle/ammo combination — it means 2MOA rifle/ammo/shooter combination. Wind drift, drop and other factors dwarf the mechanical aspects of accuracy. From such range, doing so is hard. Harder still to do that with large numbers of targets. Suicide when those targets are mounted up. It’s all suicide. But enough people might get lucky enough times for the enemy to run own of willing warm bodies. The other aspect is that the opposition never knows what you want them to do. If they stop to shoot and dismount, maybe you have a fougasse waiting. If they try to run, maybe that was your plan all along. Yeah, but they know that you don’t want them to hang you or burn their homes down. And that’s pretty much entirely in their hands. From the books I’ve read about the recent wars in Iraq and Afghanistan, the impression I got was that early in the wars the insurgents tried fighting close up and often got mauled. Obviously to maximize chances of success insurgents will have to be careful to stage ambushes at times and places where the enemy is few in number, can’t bring in reinforcements quickly, and the insurgents can safely withdraw. In an urban environment, its mostly close quarters hit and run. That and car bombs. I think you’re missing something here, with the comparisons to Iraq and Afganistan etc. There’s a lot to be learned from those tactically, since the technology is the same, but strategically they are a grossly imperfect analogy. In those wars, there’s a vast agricultural/industrial base elsewhere providing the logistical support. Only the refined, militarized, armored end of the supply chain is in enemy territory. In the US, most of the industrial and virtually all the agricultural production base would be the enemy’s home territory, as well as almost all the transport. In ways such as that, a feudal analogy is closer, with cities trying to hold sway over the farm country they depend on for food using their superior high-tech knights. You are correct, but headshots and avoiding armor are not as important as you may think. A soldier from any country will stop what they are doing if a .22LR hits them in the leg. They will take a moment to assess their wound, decide if the expedition is already taking away from their hobbies and interests, and begin to wonder about the meaning of life. It is not a matter of bravery or willingness. Suddenly losing two toes will cause you to rethink life choices. It is hard to refresh a magazine when only one wrist functions. Also, armor stops the first round. But that does not stop the soldier from having a brilliantly in-depth psychological moment. And even small bullets striking a plate hurt. Point being, modest accuracy of a rifle/user can have a significant effect. The third solution is to leave the warriors and their tanks the hell alone, and go after the folks who are telling them what to do. Ultimately all conflicts are psychological. If you are governed by your emotions, you are losing even now, no matter whether you stay on the couch or take to the fields and the streets. The Enemy is controlled entirely by emotion, so it is all up to the rest of us. If you rebel, you are being controlled by the Enemy. If you conform, you are being controlled by the Enemy. A certain detachment is required. Detached discernment. Just watch. Observe. Notice what’s going on. See how we’re being dragged into a fight of the Enemy’s choosing.